The Russian government is set to procure 14 Ilyushin Il-96s over the next 10 years, thereby ensuring continued production of the four-engined airliner. Eleven will be for the ministry of defense (MoD), including conversions into command and control or aerial refueling aircraft. 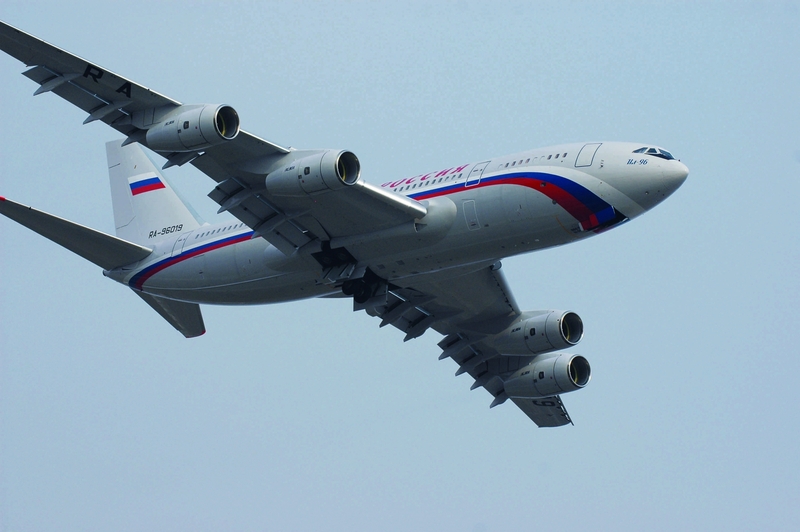 Three or four will be rebuilds of used Il-96-400T freighters, and the rest will be new production. The VASO factory in Voronezh has already completed an Ilyushin Il-96-400VPU aerial command and control aircraft for SN FSB, the special assignment department of the Federal Security Service. It is a rebuild of RA-96104, an Il-96-400T freighter built in 2011 and leased to Polyet Airlines by Ilyushin Finance Co. (IFC). The latter repossessed it plus three similar aircraft after the airline ran into financial trouble. The worsening economic situation in the Russian airline industry (due to U.S./EU sanctions and the declining value of the rouble) made it unlikely that IFC could place these aircraft elsewhere. The aircraft resumed flying in November 2014 with a distinctive satellite communication antenna on the upper side of the rear fuselage while keeping remains of Polyet’s livery. This month, the Russian defense ministry awarded United Aircraft Corporation (UAC) a contract for two Il-96-400TZ aircraft. The suffix Z indicates an aerial refueling role (Z for “zapravshik” meaning “tanker”). The MoD said that the new tankers shall be able to transfer 65 tons of jet fuel at a point 3,500 km from takeoff. They shall be equipped with containerized UPAZ-1 universal apparatus already in use on the Il-78/78M, these being the current standard air tankers of the Russian air force. The larger and longer-range Il-96-400TZs would primarily serve Russian strategic bombers on long-endurance missions hour patrols well beyond national borders. VASO general manager Sergei Urasov told Russian journalists that two Il-96-400s are destined for the air detachment serving the president of Russia. This already operates four Il-96-300PU aircraft and awaits a fifth late this year. The Il-96-300 version with maximum takeoff weight of 240 to 250 tons preceded the Il-96-400 stretch whose mtow is boosted to 270 tons, and the range to more than 12,000 km. Meantime, sources in the Russian airline industry indicate that most of the Il-96s previously operated by Aeroflot and other commercial airlines are likely to make their way into Russian government service. Airframes unworthy of a factory rebuild will be dismantled for parts to support operational aircraft. The only possible exception to this rule would be a couple of ex-Aeroflot jets that might find their way to Cubana, the only foreign operator of the type. On December 24, the intergovernmental commission for trade, economic and scientific-research cooperation between Russia and Cuba signed a preliminary contract between IFC and Aviaimport S.A., to place an Il-96-300 with the Cuban national carrier. Delivery is due in this year's second quarter, and will increase Cubana’s fleet to six aircraft.